Dear friends, do not be surprised at the fiery ordeal that has come on you to test you, as though something strange were happening to you. But rejoice inasmuch as you participate in the sufferings of Christ, so that you may be overjoyed when his glory is revealed. If you are insulted because of the name of Christ, you are blessed, for the Spirit of glory and of God rests on you. If you suffer, it should not be as a murderer or thief or any other kind of criminal, or even as a meddler. However, if you suffer as a Christian, do not be ashamed, but praise God that you bear that name. For it is time for judgment to begin with God’s household; and if it begins with us, what will the outcome be for those who do not obey the gospel of God? And, “If it is hard for the righteous to be saved, what will become of the ungodly and the sinner?” So then, those who suffer according to God’s will should commit themselves to their faithful Creator and continue to do good. This is a tough passage. Let me explain why. Peter starts it by talking about a ‘fiery ordeal’, and he makes it plain from the context that this fiery ordeal is the experience of persecution which afflicts the Christian community. From 3:8 onwards this suffering has been in view. Peter has spelled out two different ways in which we might suffer: because we have failed to demonstrate the character of Jesus (4:15), and because we have lived accordng to the character of Christ. (3:14, 17; 4:16). Peter’s world was a harsh world, and brutal punishment was the normal response of the law. Peter is saying that they might find themselves in trouble for doing good or for doing ‘evil’. There are many people who are ready to misunderstand this passage. Only today I was reading an American blog where the ‘household of God’ was taken to be the US of A, and the judgement to come would separate the white, Aryan Christians from the horrid foreigners. That’s neo-Nazi drivel, and hateful. And I don’t believe that it represents Peter correctly. Peter’s focus throughout this letter has been on helping the people of God to live holy lives as a missional imperative. He never once turns his attention to the nasty old world outside; he is looking to address the church community. That very community, the household of God, is the scope of his letter. He wants it to be right, so that it can do its job. And Peter begins with God’s Purpose in allowing persecution to come. It is for judgement – discernment. It reveals what lies within us as we go through it. It is like the refining of metal. When Peter ‘it is time for judgement to begin with…’ he tells us that this experience we undergo is a judging experience. And although he uses this as a warning – just imagine how awful it will be for the wilfully disobedient – his attention is on us, not on them. This household is a mixed up place, and tough times will expose what drives us. To use Peter’s own examples – persecution will brng two outcomes. The meddler and the murderer will be shown up for what they are; the true disciple will stand firm. Second aspect of this persecution – which God permits; he does not send it. Human hatred fuels it; God redeems and redirects it. The second element is that God’s presence can be found in it. ‘Commit yourself to your faithful creator’ he says to the believers. Find God next to you as you go through this. How? Because (3:18) you are walking where Christ walked; because you are watching (4:13) to see his glory revealed; and because you are wreathed (4:14) in the Spirit ‘of glory and of God’ For those who, like Stephen and Peter and the earliest disciples, undergo persecution, there is a blessing of joy reserved. The third truth that Peter unveils is this: God’s passion is that we (4:19) ‘continue to do good’. (3:11,13,17) 4:7-11 spells out exactly what Peter means. The best outcome of persecution isn’t that we simply survive it, but that we continue to do good through it. That we demonstrate in the middle of adversity the very best that humnakind can be when empowered by the Spirit of God. A few of you might be able to look back to the dark days of the last war. Adversity did not reveal everyone to be a hidden saint. The blitz showed up some to be dishonest, others to be unpleasant. But it brought out of many that desire to bless, to work together, to help. It brought us to a moment of judgement, and revealed the person within. And the real heroes were the ones who continued to do good through it all. So we must surely pray for those who are being persecuted. But who are they? Obviously, the persecuted church. Can I mention particularly the church in China – growing rapidly, but undergoing a time of trial just now. Visible marks of Chrsitianity are being removed (crosses etc) and the unregistered churches are being controlled. For the persecuted Church, pray for strength to do good to those who eprsecute them. For faith to continue to trust God. For joy as they stand and do what is good and right in the name of Christ. Pray also for the Western church. What we’re experiencing isn’t persecution. Often it is extreme indifference! But it is bringing us to the time of trial. How are we going to react and respond? Pray that we may respond by ‘continuing to do good’ – that’s the way of Christ. Pray for integrity; that the fires will reveal gold and not stubble and straw. Pray for openness – to the Spirit of God empowering, filling and equipping. Pray for boldness, that we grasp the freedom we have. Pray finally for persecuted individuals: for children and yp who are abused or intimidated because of their faith. For those whose husbands or wives smother faith – and that can even happen in churches. 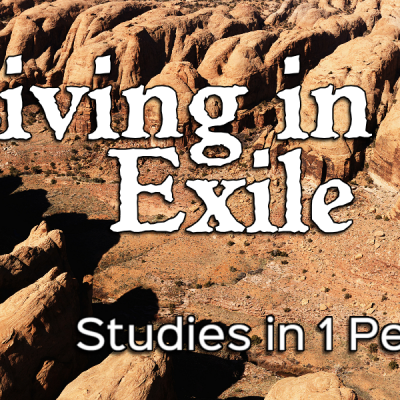 Series: 1 Peter - "Living in Exile"